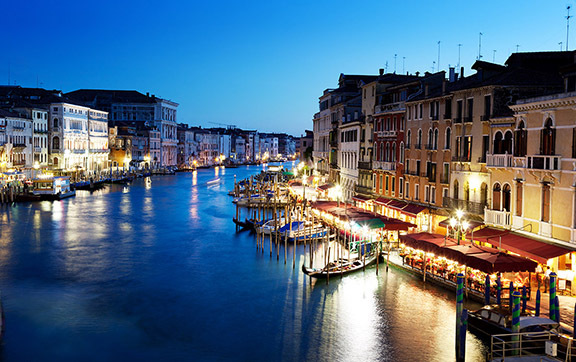 Say ciao to the ethereal city of Venice and kalimera to the beautiful Greek Islands. Between tastings of tzatziki and souvlaki, paddle in the limpid seas of the Aegean, while travelling back in time as you wander the old towns of beautiful Crete, Rhodes, Mykonos and Kusadasi. Kotor, with its labyrinthine streets and well-preserved architecture, gives you another World Heritage site to cross off your list. Stately describes the Royal Suite. Commanding and majestic. Perfect for entertaining. Enough living space to roam. The pinnacle of good living. Available as a one-bedroom configuration or as two-bedrooms (as illustrated) by adjoining with a Veranda Suite. With a shared veranda, this accommodation provides an easy transition from peace and privacy to the energy and excitement of the onboard social scene. A quiet sanctuary. The sitting area of the Vista Suite has plenty of room to relax. Large picture windows frame panoramic ocean views. The perfect backdrop for breakfast in bed. Authentic experiences, simple pleasures. Shared moments. Silversea’s Millennium Class luxury cruise ship Silver Shadow offer you freedom and space to design your day. Silver Shadow retains Silversea’s essence – spacious suites, a complement of only 382 guests, superior service – paired with a lively cosmopolitan atmosphere and enhanced amenities. Aboard the Silver Shadow, energize body and soul with complimentary pilates and yoga in the expanded fitness centre. Savour fine wines and regional culinary creations in Le Champagne, the only Wine Restaurant by Relais & Chateaux at sea. Or simply gaze at endless ocean views. Relish, relax, recharge… repeat…..Silver Shadow. Sparkling with silver, crystal and candlelight, Silversea’s main dining room serves contemporary, international cuisine with sophisticated elegance and impeccable service. Menus feature regional specialities unique to the voyage destination, for example, Roasted Chilean Sea Bass while cruising the Chilean Fjords and Indian Chicken Korma en route to Mumbai. During days at sea aboard your luxury cruise, choose something from La Collection du Monde, a series of signature dishes created exclusively for Silversea by the Grands Chef Relais & Chateaux. The Restaurant aboard this luxury cruise ship offers open seating dining, which means there are no assigned times, no assigned tables. You are free to dine whem, where and with whom you please. Panoramic ocean view. Terrace dining al fresco. For breakfast, lunch or by reservation for dinner at which a divine selection of Italy’s best cuisine is served à la carte. Authentic recipes and the freshest ingredients come together with flair and passion – a flavourful expression of Silversea’s distinctive heritage. Slow food is an eco-gastronomic concept that began at grass roots level in reaction to “fast food” and is dedicated to proper land stewardship while preserving cultural food traditions. For example, La Terrazza uses buffalo mozzarella from Naples, organic balsamic vinegar and olive oil from Umbria, and air dried ham out of Parma. The Emilia-Romagna region also produces Silversea’s 24 month aged Parmigiano Reggiano, while the pasta is made daily right on board. Open seating for breakfast and lunch, reservations required for dinner. The only Wine Restaurant by Relais & Chateaux at sea can be found aboard the luxury cruise ships of Silversea. Indulge in an evening where fine wines are complemented by a set tasting menu of regionally inspired dishes in an intimate, elegant setting. Our wine restaurant offers an extraordinary six course experience celebrating the world’s most distinguished wine regions. Per guest reservation fee of US$40. Soft breezes and ocean views. Lighter lunch fare by day. Grill your own fresh seafood and prime cuts for a casual dinner. Poolside menu options feature healthy CruiseLite selections and light fare for breakfast and lunch including grilled meats and fresh from the oven pizza. As the stars begin to peek out from a darkening sky, the top deck of the Pool Bar & Grill is transformed into The Grill – an intimate al fresco eatery featuring a fun, interactive Black Rock Grill experience. A preheated volcanic rock is brought to your table, allowing you to cook such delicacies as steak, veal, pork, lamb, salmon, fish or prawns exactly to your liking right at your own table. And what a table it is. A white linen tablecloth laden with delectable morsels and every seat with an unmatched view while you cruise. Reservations required for dinner. If you have special dietary requirements, Silversea will make every attempt to accommodate your requests. Please advise us of your needs on the Guest Information Form at least 75 days prior to sailing. Notification should be sent to Silversea’s Special Services Department. Relax your body and mind in this luxury cruise ship’s soothing sanctuary. Indulge in a wide range of invigorating therapies including facials, body wraps and massages. Appointments for spa services may be made on board the ship, at the spa, or in advance via My Silversea. Men’s and womens saunas and steam rooms are perfect for relaxing before your spa treatment or after your workout. Every seat in this multi tiered venue enjoys a clear view to the stage. Applaud a broad spectrum of entertainment presented during the cruise – from full scale production shows and classical soloists, to cultural entertainment and feature films. Throughout your voyage, the luxury cruise ship’s Show Lounge also presents port talks, enrichment lectures and a variety of special events. The Panorama Lounge is specially designed to provide an uninterrupted view of the day’s destination frmo the comfort of the luxury cruise ship’s interior. This is an ideal place to unwind, enjoy afternoon tea, listen to the pianist and watch the setting sun. The drinks are complimentary aboard this luxury cruise, the music live and inviting. Enjoy dancing to a range of musical styles for every taste from standards to the latest club mixes. Onboard choice reigns — the freedom to do everything or nothing. Pamper yourself at our beauty salon. Find the perfect bauble in our boutique. Test your luck in our casino. Enjoy an invigorating workout. Curl up with a good book in our library. Or simply soak up the sun on the pool deck. At Silversea, the choice is always yours. Beauty salon and hair styling services are available, including manicures and pedicures. Appointments for these chargeable services may be made onboard the ship, or in advance online via the My Voyage feature at Silversea.com. Exceptional shopping experiences do not end in the cosmopolitan cities we visit. Silversea’s striking new shipboard boutiques, reimagined and redesigned by famed Italian architect Tiziano Vudafieri and his team at Vudafieri & Saverino Studio, are stunning modern design spaces befitting the finest creations from legendary designers including Buccellati, Damiani, Bottega Veneta, Balenciaga, IWC, Piaget, Gucci, La Prarie and more. A new partnership with the LVMH Group company Starboard offers in our boutiques a carefully curated selection of cutting edge fashions, jewellery, accessories, fine perfumes and cosmetics from iconic brands renowned for blending tradition, innovation and exceptional quality. The Fitness Centre on board this luxury cruise ship is equipped with free weights, weight machines, state of the art treadmills, elliptical trainers and recumbent and upright bicycles. Classes in aerobics, yoga, pilates and circuit training are led by the onboard fitness trainer and are always complimentary. Personal training, body composition analysis and specialty classes at the Fitness Centre are available at an additional charge. The Library aboard this luxury cruise ship has an extensive selection of hardcover books, magazines, reference materials and newspapers, as well as audio listening stations. Movies are also available and can be viewed on your insuite entertainment centre. Chaise lounges arranged in the sun or shade. Bubbling whirlpools. The pool water refreshing in warmer climates, heated for cooler weather cruises. The attentive staff at the ready with an oversized towel as you emerge from the pool, with your favourite beverage at just the right moment. The luxury cruise ship of your dreams.